Are you still using bulky, heavy, expensive, loud pressure washers? 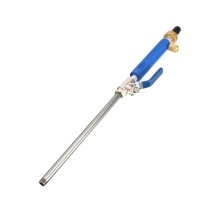 It is time to stop using them and try this water jet, it will turn your ordinary hose into a high power washer. Made of aluminum alloy and copper, it is not easy to rust and has a long service life. Easy to use and install, can easily connect to any water hoses. Two spray tips can meet the different needs of cleaning and spray. Wide range of uses, you can water the flowers, wash the car, bathe the pet, scour the floor and deck, etc.